Management has been on a bit of a buying spree lately. Here are a few deals that could be game changers for the oil and gas giant. 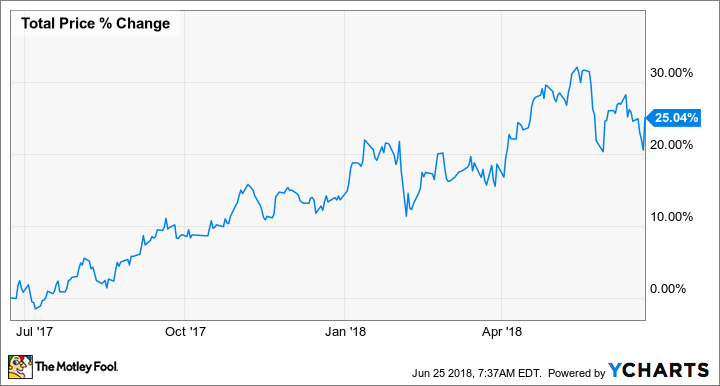 A few billion here, a billion there, and all of a sudden Total S.A. (NYSE:TOT) is one of the most active companies out there, growing its business via acquisition over the past few years. Its deals can mostly be classified in three distinct categories: buying low-cost, long-life assets that are already producing; expanding its liquified natural gas (LNG) offerings, and building out an alternative energy business. On the company's latest conference call, CEO Patrick Pouyanne walked investors through several of Total's most recent investments and what they can do for the company in the long run. Here's a look at three that investors will want to keep tabs on. [W]e closed the Maersk Oil acquisition in March, slightly went off schedule, and so now we are the second largest producer in the North Sea. At the same time, by the way, we also closed the sale of [the North Sea oil and gas field] Martin Linge. We have rearranged our portfolio with the objective to lower the breakeven of our operations in the North Sea. So it's done. It's been done. The integration is going very smoothly since mid-March. And by the way, I can only make a remark is that none of us, when we negotiated the deal in spring 2016, were thinking that the price of the barrel would be at $70 today. So there is obviously some upside, which is coming very quickly in the picture. In the original press release for the deal, Total said that Maersk's production had a free cash flow breakeven of $30 a barrel. So at today's prices, it should be a significant cash contributor in the coming quarters. Total hasn't been afraid to take on a project or an asset in a country where the political situation is less than certain. The company's winning bid to develop Iran's South Pars natural gas field was a great example of this. When the deal was signed, it was an immense resource base that could be developed for relatively low costs and could last for decades. However, the company has since needed to walk away from the project because of the U.S. withdrawal from the Joint Comprehensive Plan of Action (aka the Iran nuclear deal). On Libya, we bought 16% in the Waha concession from Marathon [Oil]. We closed the deal on March 31. It represents 500 million barrels of reserve, 50,000 barrel per day, a deal again around $1 per barrel like in Abu Dhabi. The deal is closed, of course. You have seen some information. The situation in Libya is a little tricky from a political point of view. Working with Libya isn't ideal and can change at a moment's notice. But that is reflective in the low cost of the acquisition. So if Total can make it work, it's a high-return asset. If not, the original cost was low enough that investors aren't going to be heartbroken if it falls through. This deal is akin to a lottery ticket for Total. If everything goes swimmingly, it represents an extremely low-cost production source that can be developed for years that would likely churn out gobs of cash. However, there's no guarantee that things will go swimmingly, as evidenced by the recent destruction of Libya's largest export hub as a result of clashes with militia groups. This project could be a headache for management. But if Total can make things work, it could be a needle mover for the bottom line. The reason that John D. Rockefeller created the first integrated oil and gas company was that it gave his company a better way to monetize a raw material (crude oil) by turning it into a finished product and selling it directly to the consumer. Nowadays, we say the integrated business model helps to smooth out earnings in volatile commodity markets, but there are also immense opportunities to make the most of one's production by delivering a finished product to the customer. So this fit is excellent for us because it gave us immediately a sizable market share. We are reaching 7% of market share. And you know in this retail business like we know well in our marketing and services business, market share is of essence because you amortize all your advertising, your fixed cost on the larger base of customers. And so it's a virtuous cycle. The intent is to continue to grow on this market. Direct Energie was growing by 500,000 new customers per year in the last two years. We are also on all side, we are beginning to have 2,000 new customers per day. So if you combine all of that, the ambition is to reach 6 million to 7 million customers in France, more or less 15% of the market share. Having a large, growing customer base in a business as steady as supplying natural gas to households will help ensure a certain level of demand for Total's LNG shipments into France and allow it to monetize gas more effectively. While Direct Energie's customer base for gas and its electricity generation alone isn't enough to satisfy all of Total's liquefaction and natural gas trading business, it is a blueprint that it could use elsewhere to make the most of the LNG business. While I'm of the mind that oil is likely to play a large role in our energy needs and other requirements for a long time, it never hurts to have a couple of hedges on that bet just in case it doesn't play out that way. Total's business today looks incredibly well prepared for whatever the energy industry will throw at it over the next decade. If oil remains a lucrative business, it has a large stable of relatively low-cost production sources that could be cash cows. If LNG remains the fastest-growing fossil fuel, Total's growing liquefaction, trading, and retail businesses will give it a foundation to build upon. The company even has a leg up in the renewables business with some intriguing investments in solar panels and battery storage. There's a lot to like about Total as a long-term investment. With shares still trading at 1.6 times tangible book value, it still looks like today is a good time to buy shares. Are These Oil Majors Nuts for Investing in This Sector?